After months of relative calm, market fluctuations are causing many investors to wonder what is happening to the economy. Last week, the S&P 500 lost 5.16%, the Dow dropped 5.21%, and the NASDAQ declined 5.06%. The MSCI EAFE also gave back 6.19%. These losses pushed all four indexes into negative territory for the year. 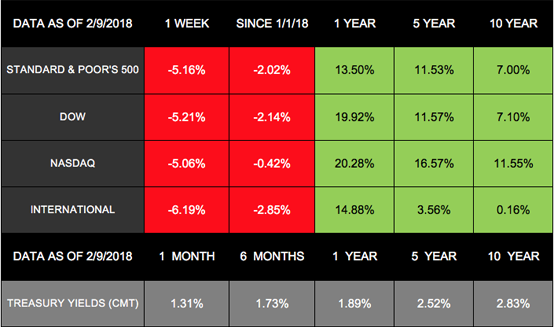 In addition, the weekly performance included significant volatility, as stocks had large fluctuations both within days and from one day to the next. The Dow, for example, lost over 1,000 points twice during the week - and also twice gained over 300 points. During times like these, viewing events in their proper context is imperative. This week, we re going beyond our typical market update in an effort to provide you with clarity and perspective. The markets started 2018 with the wind in their sails, and investors watched as indexes continued their nearly straight-up trajectory from 2017. Then, after the S&P 500's best January performance since 1997, stocks took a dive at the beginning of February. On Monday, February 5, the Dow and S&P 500 each lost more than 4%, and the NASDAQ's drop was nearly as significant. The next day, all 3 indexes posted positive returns. The volatility continued throughout the week. On Friday, February 9, the indexes recovered some of their losses, but each still ended the week down more than 5%. We understand how unnerving these fluctuations can feel - especially as headlines shout fear-inducing statistics. Our goal is to help you better understand where the markets stand today and how to apply this knowledge to your own financial life. When markets post dramatic losses or whipsaw back and forth, many people wonder what causes the turbulence and may assume negative financial data is to blame. However, the recent selloff and volatility don't have the culprits you might expect. No negative economic update or geopolitical drama emerged to spur the selloff February 5-6. Instead, emotion-driven investing may have combined with computer-generated trading to fuel the decline. In particular, after the latest labor report showed wage growth picking up more than expected, some investors began to worry about increasing inflation. Higher wages can mean companies have to raise their prices to support their labor costs, a cycle that can cause inflation to grow. Average Intra-Year Declines: Since 1980, the S&P 500 has experienced an average correction each year of approximately 14%. But in 2017, the markets were unusually calm, fluctuating only 3%. Before this recent decline, the S&P had gone more than 400 days without losing over 5% - its longest span since the 1950s. Takeaway: Markets fluctuate, and the recent lack of volatility is what's truly unusual. Percentages vs. Points: Many news articles mention that the Dow's 1,175 - point drop on February 6 was its highest decline in history. While this statement may be true, it leaves out a key detail: The higher an index goes, the smaller a percentage of its total that each point represents. In other words, 1,175 points doesn't have the same impact at 25,000 that it does at 10,000. Takeaway: Focus on percentages, not points, to gain a clearer view of market performance. Recovery From Bad Days: The S&P 500 fell 4.1% on February 5, but within 1 day, the index regained 1.7%. Then, on February 8, the S&P 500 lost another 3.8% but gained back 1.49% the next day. This performance surpasses historical data. If you analyze the S&P 500's 15 worst days - where the index lost an average of 8.16% - stocks were still in negative territory 1 day later. However, in 13 instances, stocks were back up within a year by about 21%; they remained in positive territory 5 years later. Takeaway: Even when stocks lose more ground than they just did, they tend to recover and positive performance usually returns. In August 2011, the S&P 500 lost 6.66% in one day. At that time, the European debt crisis was in full swing, the U.S. had lost its AAA credit rating, and the financial sector was reeling. Volatility measures indicated that many investors were becoming worried. Facing that situation, impulses to leave the market and avoid further losses could have arisen. As is so often the case, however, staying invested paid off. Over short periods of time, the market trades on fear, anxiety, greed, and emotion. Over the long term, however, economic fundamentals drive the markets. Labor Market: The economy added 200,000 new jobs in January and beat expectations. Average hourly wages also increased, bringing 2.9% growth in the past 12 months - the largest rise since 2008-2009. Corporate Earnings: The majority of S&P 500 companies who have reported their 4th quarter results have beaten their earnings estimates. Service Sector: The latest reading of the ISM Non-Manufacturing Index (which tracks performance and expectations for service-sector businesses) hit its best level since 2005. Consumers: The most recent data indicates that personal income and spending are on the rise. As investors try to determine whether inflation is on the rise and higher interest rates are imminent, volatility could continue. After last year's smooth sailing in the markets, these fluctuations may feel harder to withstand. The reality is that equities don't move in a straight line. Even if volatility is here to stay, we know that price changes can provide new market opportunities. We agree with the economists at First Trust who assert that, "More economic growth will ultimately be a tailwind for equities, not a headwind." We encourage you to focus on your long-term goals, rather than short-term fluctuations. As you do, avoid allowing emotions to derail your plans. We also want you to feel comfortable in your financial journey. If your thoughts on risk have changed, call us so we can help you find the best path forward. As always, we are here to provide you with clarity, perspective, and support during every market environment. Thank you for the confidence you place in our abilities. We consider it a privilege to be good stewards of the assets you entrust to our care.